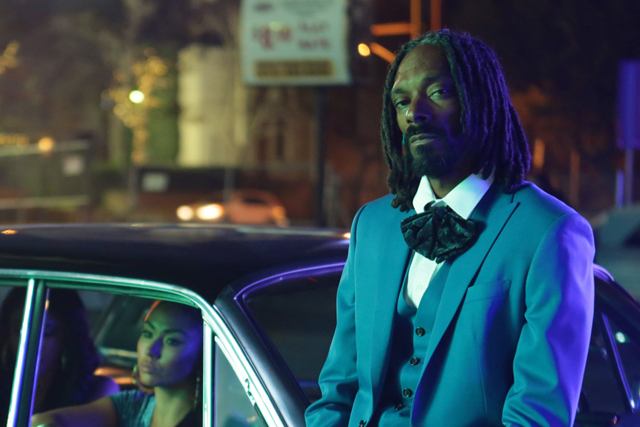 MoneySupermarket.com is looking to take its on-going 'You're So MoneySupermarket' campaign to the "next level" with an ad starring hip-hop star Snoop Dogg. The price comparison site’s latest TV ad, by Mother, was filmed in Los Angeles and features "skinny British dude" Phil feeling so "epic" about his savings that he decides to drive an invisible Chevy Low Rider through the streets of Compton. Playing Snoop Dogg’s classic hit ‘What’s My Name?’, Phil cruises past "hip-hop honeys" and "Gs" before pulling up alongside another Low Rider, which Snoop Dogg is leaning against. The rapper then turns to the camera and says, "Save money and feel like Phil." The campaign launches on Sunday 2 February. Speaking to Marketing, MoneySupermarket brand director Gareth Helm said it is important to "lift the lid" off the campaign in the face of intense competition: "We’ve got tough competitors – the meerkat, the opera singer, the robot – and, as a sector, we’re famous for great advertising. We’ve got to keep getting better, keep moving on and up. When I look at my competitors, the meerkat is wearing out and getting a bit tired. How many meerkats can you collect? "We celebrate people saving money. There is a really strong insight that when people save money, they feel great. In this genre, for Snoop to say you’re epic is probably about as big as it gets. We’re staying true to the campaign but lifting the lid off it." Helm said he believes MoneySupermarket is in a "good position" to tackle the increasingly "tired" Comparethemarket.com campaign featuring its meerkat mascots. He said: "I think we’re in a really good position because we own an insight that people relate to. When I look at my competitors, the meerkat is wearing out and getting a bit tired. How many meerkats can you collect? It’s also a bit gimmicky." "One of the strengths of Comparethemarket.com is that they have been pretty continuous and they have supported their characters for a long period of time. Their campaign has gone on longer than ours, and as a result has created a bigger brain stamp with consumers. "Our campaign is much younger than theirs, and, if we believe in it, we must stick to the formula and just make it better and better."